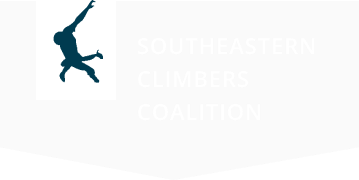 The SCC, along with our members and community partners, works hard to preserve climbing areas in the Southeast. Help protect what you love. The Access Fund and SCC have recently acquired a boulder field called Hell’s Kitchen and a property securing a critical access point to the Dogwood Boulders. Together we are working to raise $167,000 to cover the purchase price, transaction costs, and necessary trail and stewardship improvements for sustainable access. Prentice Cooper (Tennessee Wall) has announced the 2018 hunting closure dates: October 4-6, 20-21, 25-27 November 2-4, 24-29 No climbing is allowed during these dates. Crockford-Pigeon Mountain (Rocktown, Lost Wall, and Zahnd) have announced their 2018 hunting closure dates: October 13-14 November 8-10 December 5-8 No climbing is allowed during these dates. Adam Johnson, Shannon Milsaps, Todd Clark, Eric Danielson, Alma Baste, Jacob Johnson, Paula Harding, MAKE Adventure Stories, Nathalie Dupree.